The lovely ladies in the Unofficial Women's Weekly Group on Ravelry are owed a giant hug for providing the motivation to create this beauty. We were encouraging each other to complete the various knitted afghans we were making. 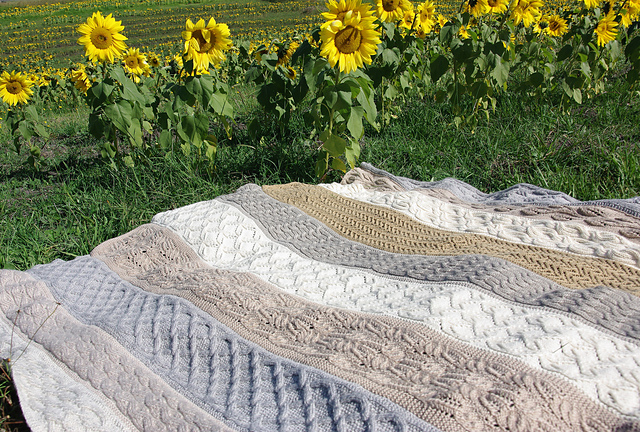 Many of us were doing variations on the classic, knit a square - make an afghan. However the sheer horror of the concept of all that sewing was a giant hurdle many were baulking at. So I thought, why not make strips instead of squares. 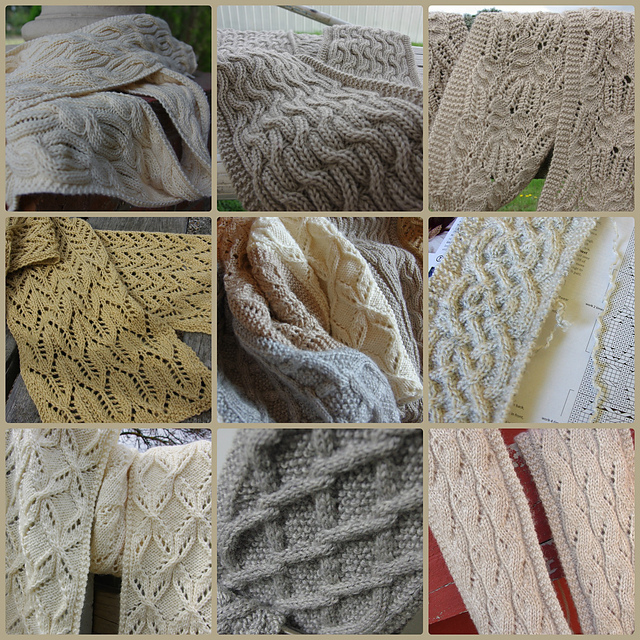 Essentially I knit all my favourite cable and cable and lace scarves that caught my eye recently and sewed them up into a lap blanket for me. The genesis of the idea, the inspiration and the early stages of construction are described in more detail in this blog post (Anyone got cable! - A scarf-ghan). This was a great strategy. 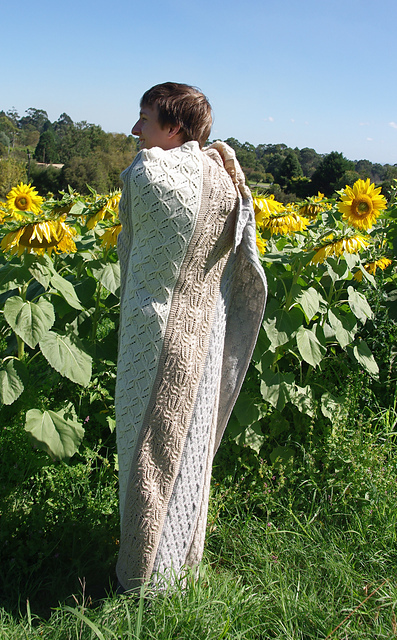 There was a constant variety of patterns and yarn in little do-able chunks at a time. I didn't get bored in the middle of the process. Each scarf got a chance to tell its own story along the way. 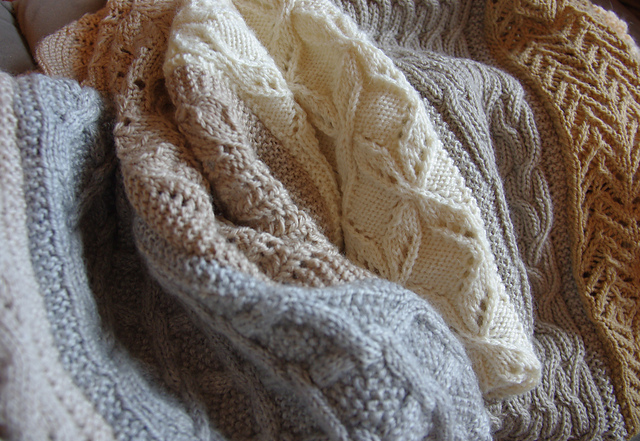 See also a series of scarves = afghan for the details of each scarf strip - e.g. patterns used. As a bonus most of them are free patterns. On Good Friday we convinced the afghan to come and play in the Sunflowers and have its final beauty shots taken. The town I live in has two giant public art installations designed to brighten up some depressed and unused industrial areas of town. These photos were taken in a field that is a giant spiral maze of sunflowers. (You can read more about the project here - #getsunflowered). I admit, I did wimp out of this without strictly finishing it completely. 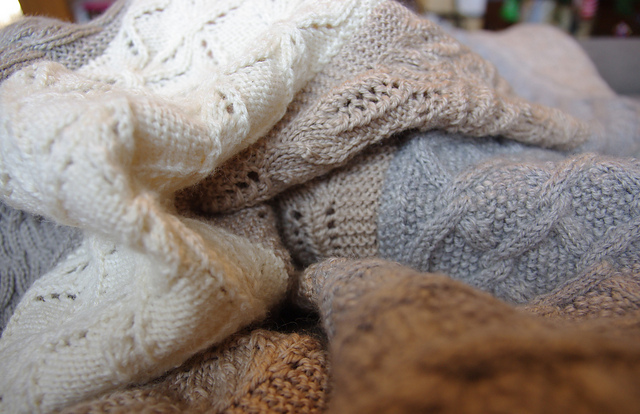 I haven't added a separate knitted edging. I toyed with both a sideways knitted garter stitch and an i-cord border (and had a go at both) but felt it didn't really need it enough to make me feel justified knitting it. Here's the boy demonstrated how you can wrap yourself head to toe in the awesome snugness. He make the blanket look like a butterfly chrysalis. I'd like to thank my children for frolicking in the sunflowers with me. I'm off to plan the next afghan adventure now. I don't think I quite have it out of my system. 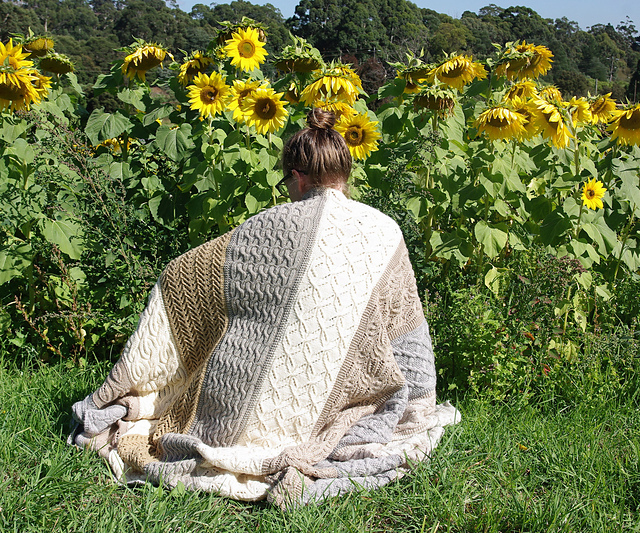 I might just snuggle here under my blanket while I knit the next one.